In visual arts, Mabel Poblet applies a practice deeply rooted in the history of culture: the documentation of voyages. Since ancient times, travelers have made accounts of their voyages. These chronicles, regardless of their diversity and of the time when they were written, usually aimed at discovering and, at the same time, sharing new experiences. For Mabel, however, the story is not important. Each piece – or page – in the diary focuses on the impressions on the senses, on the memories, and works as a palimpsest. Overlapped layers of memories become stitched with the idea of accumulation and synthesis, two concepts that might seem opposed but which are not, given the integrating nature of the resulting artwork. The viewer does not have to find chronological or specific references of the origin or the circumstances of each image. Relevant is what lives inside each piece, or, in other words, the perception of being in front of a mosaic where the meaning goes beyond the specificity of history. Therefore, we are witnessing a proposal in which the orientation of the senses is more than a simple anecdote. Fragments come together as the articulation of many realities leading to a new reality. This is possible because the artist works from the suggestions of poetry while urging the viewer to build a metaphor of the trip, a memory that can be either his own or the one of others. Of course, the viewer must discover the key to each visual work. There are cities, urban grids evident in two of the works in the series. Another work focuses on the physical reflection of barrenness, on the impact of time on the physical reality of the urban landscape that leaves on the pupil an incandescent imprint related to the erosion produced by days. In another, also harmonically conceived, streets, houses, doors, facades, all from diverse origin, reveal itineraries that were once certain and now become a lyrical evocation of places that could have been a dream. Mabel emphasises the evocative geometry of the pyramids. She even makes pyramids look as formations exceeding the two-dimension scale. This type of structure certainly encloses a kind of Pythagoras-style mystery due to the regularity of the proportions, its antique lineage and the assumption of its virtues as reservoirs of spiritual energies. However, because the artist presents the structures in thoroughly worked textures, the impression one gets cannot be reduced to mere symbolic speculation. The pyramids in these works refer to an existential pleasure that we can interpret freely as personal pleasure in our own life. Nevertheless, let us return to the dominance of landscapes in this exhibition. Whoever wants to become immersed in the vastness of the ocean and the open spaces can do so through the works in which predominating blues stimulate a most serene contemplation. Whoever intends to breathe in the atmosphere of a garden, which is the sum of all possible and impossible gardens, will have at his or her hands those flowers that explode with the passion of a soft and inspiring fire. The only limit for Mabel Poblet is the circumference. Everything can fit inside it and nothing exists outside the circular armature. The circumference is the pre-established border so that nothing can escape from the imagination. For the artist, this is the definition of the vital cycle. The materials used are also submitted to that principle. Clips of photographs, acetate sheets, fixers and other elements interact as support for those visions concentrically structured, as if the fragments responded to the logic of an agglutinating dynamic force without we can never do. Aimed at not exhausting herself, however, the artist opens a surprising gate in the exhibition sequence. A work she considers a “penetrable” space, and which is nothing else than a performatic installation, introduces the viewer into another aesthetic dimension. Not viewer anymore, one becomes the protagonist of one’s own voyage immersed in a space of sheets, mirrors, lights and shadows to experiment the progress of the voyage accompanied by sounds complementing the adventure of the senses. Vision, touch and hearing unfold their potential through the duet formed by Poblet and the creative talent of Andres Levin, Venezuelan-born producer and composer of acknowledged credentials in fusion music applied in performing arts. Every voyage is a way of learning. Mabel Poblet does not return to Ithaca empty-handed, on the contrary she returns with her hands full of images plethoric of meaning and beauty. Certainly, this harvest will have a profound impact in the sensitivity of those who get inspired by these images to undertake their own voyages. Mabel Poblet (*1986 in Cienfuegos) graduated from both “San Alejandro” Art Academy and the University of the Arts (ISA) with top grades. Her distinctive, penetrating style has made her one of the best-known visual artists in Cuba. She currently lives and works in Havana. 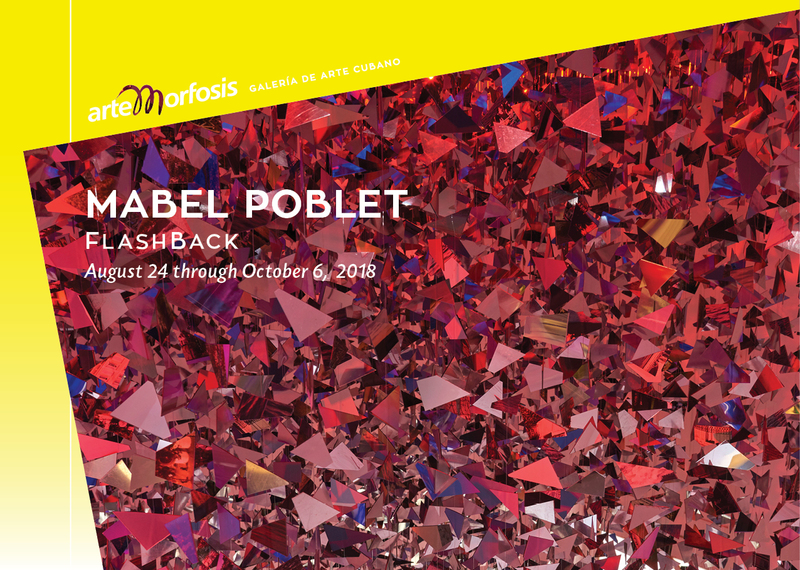 Poblet’s works from her exhibition FLASHBACK are best described as creative constellations; the circular, kaleidoscopic compositions are made up of a series of associations, pieced together like a mosaic. Her works create an intimate dreamscape, a ‘starry map’ of her experiences, thoughts and collective memories. Her orb-like wall sculptures explore landscapes ranging from oceans to cities, and are uniquely created with materials like photographs, acetate sheets and light itself. Her multi-sensory ‘penetrable’ installation offers a space for reflection and escape, immersing the viewer in sound and light. Perhaps the most poignant aspect of Poblet’s installations is the invitation she extends to her viewer, inviting them to explore not only her own life, but to embark upon a voyage of their own.